Marvel and so much more in this gift basket! Two Activity Books (Transformers, Teenage Mutant Ninja Turtles, Star Wars, Cars, Spiderman, or etc. ), Finger Football Game or Pool Game, Rubber Darts Game, Glider, Bubbles Wand, Cookies, Mini Metal Cars, Puzzle box (various Marvel characters), Starburst, two packages of Snack Crackers (2 varieties), Chocolate Bar, Crayons, and Playing Cards set into a stackable storage bin. We wrap in crisp clear cellophane and top off with a handmade bow. Includes a handwritten greeting card. Wrapped for local hand delivery approximately 10"w x 9"l x 15"h. Shipped designs will be shrink-wrapped with a different type of enhancement than a bow like the photo. 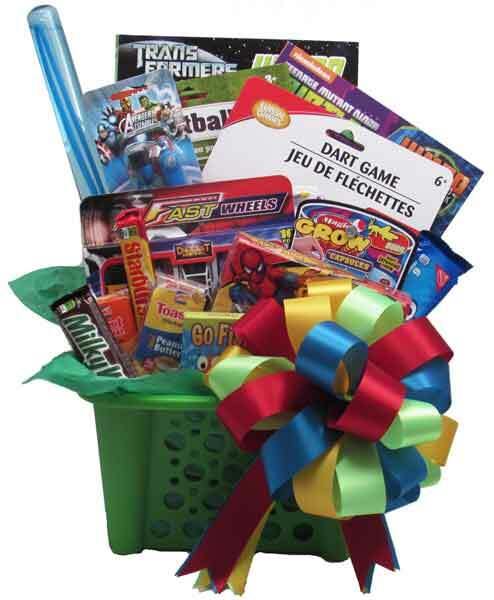 Note: We can design in an Easter basket for an Easter gift. Just let us know in the Special Instructions during check out.